I have produced a clone for the the Davis Vantage Pro and Vantuge Vue. It has the same logging capacity as the Davis logger, and can be setup using WD Davis logger setup function. 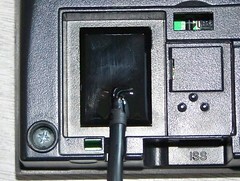 The USB connector has integral LEDs to view data traffic. Available in USB (using the reliable FTDI chipset) version currently, but Serial version ready soon. priced @ £50 (GBP) including delivery (outside the UK please check as postage may increase the cost slightly. 10 more available from early next week, price including worldwide shipping £50! 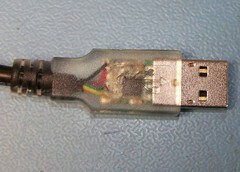 Be aware that this uses the more reliable FTDI USB interface. An new USB version is on the way allowing for setup with WeatherLink (serial version already supports this) for existing license users. Same price, same great workmanship! I have 3 serial and 5 USB version loggers left for sale. Price is still £50 this includes worldwide shipping. BTW the paypal button works now! I can happily report that it also works with the Davis Envoy, it communicates with no problems to a Debian Squeeze (6.x) system, wview recognizes it as a standard Davis adapter, and the wview Davis utilities correctly work with it to set the various parameters (lat/long, alt, snapshot storage, etc). I could not be happier with this adapter. Thank you belfryboy! I have 2 finished and ready to ship If antyone would like one. Another 5 ready soon. Hi, just bought one, money sent by Paypal! Thanks! That's all of them for this batch, new batch of boards will be ordered next week so watch this space! Very interesting, will it work on the EU VP2 version? It will work with the VP2 EU version, in fact that is what I use to test the finished loggers. I am currently working away, but will be making a few more at the weekend. PM me if your are interested.